I’ll keep updating this list before the draft. This is a first attempt having watched the players listed. There are some I still need to watch. I’ve felt for a long time that Kyler Murray is the most talented player in the draft and should be the #1 pick. Very little separates the top defensive prospects. Quinnen Williams and Nick Bosa are the best but the upside of the others is top level. I’ve added Devin Bush and Montez Sweat to this group following the combine. Traits matter in the NFL and both players tested well enough to warrant a first round grade. All four of these players will go in the first round but I wanted some separation from the top tier. Andre Dillard is the best left tackle in the class. I marked Clelin Ferrell and Christian Wilkins down after the combine because neither tested as well as I expected. Josh Allen is a consensus top-five pick in the media but I still can’t shake seeing him handled by tight ends. Both Simmons and Anderson would be first round picks if it wasn’t for injuries. Simmons tore his ACL training for the combine and will miss the entire 2019 season. Anderson suffered a similar injury during the 2018 season. Neither player is expected to go in round one as a consequence but both possess first round talent. Most people appear to be projecting between 10-15 legit first round prospects in this draft. Much will depend on how you view the quarterbacks. 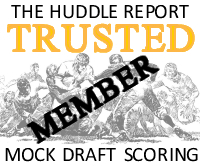 Some teams will have Drew Lock and Dwayne Haskins ranked very highly. The likes of the Clemson trio, Andre Dillard and Devin Bush will also receive fluctuating grades. This draft class provides quality depth at various positions but there’s not a strong pool of first round prospects. What does that mean? A lot of teams in the 20’s will want to move down and players drafted in the late first round will carry similar grades to the players drafted in the 40’s. There will likely be a run on receivers between picks #20 and #40. There’s a chance for the late first and early second round to be dominated by wide outs. It’s possible none of the safeties will be taken in the first round. If that happens, things will pick up on day two. Many of the top safeties ran in the 4.3’s or 4.4’s. Teams will look at this group and see range and versatility. The ‘big nickel’ is a vital position these days and a lot of these safeties either played nickel full time in college or split their time. The other position that could kick into gear is tight end. We could easily see Noah Fant, Irv Smith Jr and others (including Josh Oliver) go in the first frame. The earlier those three leave the board, the greater the chances of several other tight ends finding a home in round two. Dawson Knox could very easily be taken in this range and with many teams needing a tight end, some of the third round prospects could be pushed up a round. There are a few names on the list I want to talk about briefly. Dru Samia the guard at Oklahoma is extremely physical and squares everything up. Watch his performance against Alabama. I think he’ll go a lot earlier than many are projecting. Utah’s Marquise Blair has the athleticism and quickness to excel at nickel and packs a punch as a tackler/hitter. He too might go a bit earlier than the consensus is predicting. Trysten Hill remains devastatingly underrated despite arguably the best combine workout at any position and Justin Layne could easily go in the first round (and could even be the first corner drafted). This is an excellent draft in rounds 2-3. Seattle’s challenge is to try and find a way to turn #21 into multiple day two selections. If they manage it, they’ll have plenty of options at several positions of need. Plenty of these names are borderline second round prospects. You could easily make a case for the receivers listed to go in round two. Miles Boykin had an exceptional combine, Hakeem Butler performed better than expected and J.J. Arcega-Whiteside boxes out defenders better than any receiver I’ve watched in college previously. Gary Jennings is underrated. They all have size. The athletic potential of offensive linemen Chuma Edoga, Isaiah Prince, Michael Jordan and Connor McGovern could push them into round two on some boards. It’s also very possible Dalton Risner and Greg Little go earlier than I’m projecting here — it’s just a personal preference. Jachai Polite I have falling due to a lack of size, length, speed (needs a good run at his pro-day) and some emerging character question marks. Mack Wilson is about as natural in coverage as you’ll ever see by a linebacker but a lack of great testing numbers and mediocre tape around the LOS has him lasting in this projection. It wouldn’t be a surprise at all if Charles Omenihu, Gerald Willis and Ed Alexander carried second round grades by some teams. Many of the defensive backs listed could be graded a round earlier. As with the second round, this list really shows off the value you can expect in rounds two and three. The Seahawks will have plenty of options at receiver, D-line, tight end and safety/nickel after they inevitably trade down from #21. Riley Ridley (WR, Georgia) is a player I’ve found it very difficult to get excited about. His tape always felt underwhelming and his physical profile is average at best. I need to watch more of Tytus Howard (T, Alabama State). He received a lot of praise at the Senior Bowl despite that rep against Montez Sweat. I also want to watch more of Dax Raymond (TE, Utah State). Max Scharping (T, Northern Illinois) is a player that some people see as a possible high pick but he didn’t stand out at the Senior Bowl. I really liked David Edwards’ (T, Wisconsin) 2017 tape but he didn’t test well and just doesn’t seem to have any momentum. Yodny Cajuste (T, West Virginia) failed to build his stock by not working out at the combine. It was tempting to include Daniel Wise (DT, Kansas) in round three. How does Juan Thornhill tape look? He has to have peaked interests and could be a deal? I found his tape a bit underwhelming. Rob, do you believe that since Trysten Hill still remains underrated as well as the reported coaching issues may cause him to slide to round 3? 1. With the apparent value in rounds 2-3. do you see several teams wanting to trade down, making finding trade partners more difficult for the Seahawks? 2. How far below Round 3 do see Greg Gaines? I would consider Gaines in R4-5. Lots of teams will want to trade down but I think that was the case last year too. First brexit… then the Mueller report…and now the NFL draft. The world suspends from chaos. My predelictions…there will be collusion with the evil empire…need I say that a deal will be struck with The Patriots? There will be a new word added to our beefy vocabulary…Russell willyougiveup3firstroundpickson. And finally Frank Clark will be resigned. The 41 players listed for Round 2 & the 41 players listed for round 3 would seem to leave a lot of players as falling into round 4 on your list. That’s probably a good thing as the Seahawks MAY not be able to get more than one (likely 2 at best) 3-rd rounder so they’ll likely trade down for some 4-th round picks and beyond as well. After their late 1-st/early 2-nd round pick(s) are done, picking at least twice in each of the 3-rd & 4-th rounds has to have some decent prospects that’ll make for a successful Seahawk draft, that would seem to be where a lot of the prime meat is positioned currently. This years UDFA’s class should also be an interesting pile to pick through looking for gems. Gotta imagine there’s not even a 0.0000000001% we don’t trade down just seeing the value to be had makes me want to trade down as much as possible as long as we are getting value. Regardless of how many times we trade down we need to find our first trade partner. I think it’s most likely the Packers or Patriots as they both could use a tight end and might be inclined to trade up to 21 and grab Noah Fant. We could probably pick up a 3rd a 5th for that kind of trade. Also, what do you think the prime number of times to trade down is Rob? I’d hate to get out of range for one of the top receivers. I think you look to trade down once into the late 20’s and then assess the value of a second trade. Greetings, I’ve been reading this blog regularly for the past 3 years, but never have added a reply. I’ve enjoyed watching the NFL for close to 60 years, and mostly for a basic appreciation of the game itself. I think I have learned more about football in the past 3 years from reading this blog than the previous 57 years (or so) of viewing it from a strictly fan perspective sans analysis. Thanks, really!!! Nice to see you post! I agree I have learned more about the draft and how they scout and grade players in the last 2-3 years since finding Rob’s blog than I had all the rest of my 40yrs watching football. Outside of top tier talent I really do like the potential in this draft to find and identify solid depth pieces on Day 2/3. What a year to not have any picks. I really hope trading back ends up being fruitful for us – which I have a feeling it will as there’s always some team who wants to make sure they pick up the last QB on the board or get ahead of a positional run. I’m hoping we end up with a few extra picks in Rds. 5-7. RB Darwin Thompson – possibly one of the freakiest athletes in the draft, had an amazing season at Utah St.
WR Darius Slayton – I think Auburn’s regression this year has him being overlooked, awesome athleticism and history of explosive plays. Reminds me of Paul Richardson. LB Otaro Alaku – physically reminds me of KJ Wright at first glance, put up good numbers last 2 years. Anyone have a take on these guys? He’s a 200lb QB, of course he should try to avoid taking shots in the open field. The coaches should light him up if he didn’t. I feel PC is sold on Hill, but not much on T2. I don’t think we’ll pick a safety to start, PCJS might pick someone to compete and be a backup, but I doubt after all his comments recently, they’ll pick a safety early (first 2-3 rounds). He loves Poona and Martin. But he needs DT depth, so I feel like they’ll pick a DT somewhere along the draft. He was hopeful about Doug, but I feel based on his comments, WR might be an important pick. He was optimistic about Dissly, but TE will be important too. I hate him putting Prosise at RB3. LB position is set. I feel we’ll pick WR and TE in the first 3 rounds. DT, safety between 3-5th, CB between 4th and 7th. Not sure about DE/EDGE. Our depth is pretty good, so I think we needs a really good player there or no player at all. Rob, we must draft a WR. Baldwin is crawling to the finish line and the rest of the group besides Lockett are below avg. Our O is going to be in some trouble in ’19. Stack the box. Bring run pressure and we’re done. Which WR are we going to draft? A guy in round 3 is where I believe we’ll utilize the selection. Help! Thanks…. Lots of good options this year. If it’s round three could be Gary Jennings. WR-Jennings, WR-Sills and TE-Wesco are all W. Virginia teammates with QB-Grier. Wouldn’t picking one or more of them (IF they select Grier as QB) give them a rookie QB with a little boost to his confidence and end up being a + move? Might be at least a slight consideration, depending on how the draft goes down and which WR’s are available when they make their actual WR pick. Maybe Rob, that’s why you’ve mentioned Jennings several times now? He could be a very good pick depending on his draft cost. I’m thinking he’s possibly a early-3-rd. to mid-4-th. rounder? If so, that could be a good place to get him. 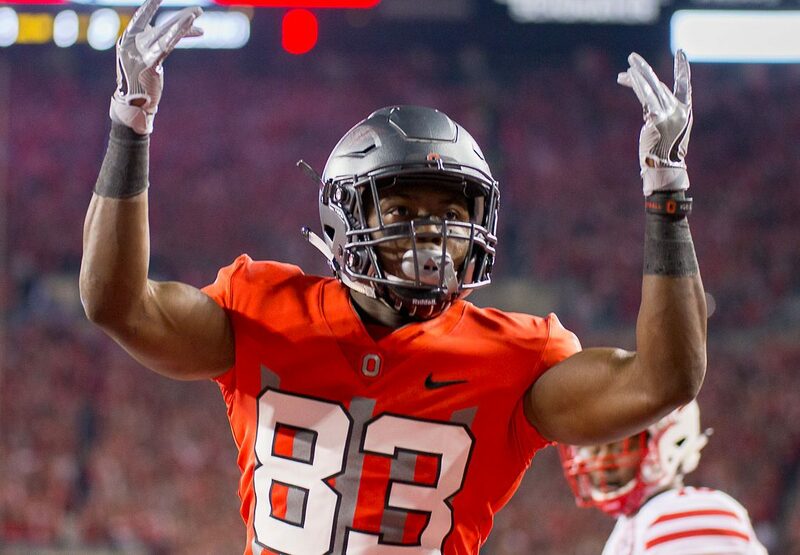 If EDGE, or FS is their 1-st pick in the draft, the 3-rd round is very likely when they’ll want to make a selection of a WR with their 2-nd (or 3-rd) pick in the entire draft? Unless, they go with a safety as their 2-nd pick, after they select an EDGE, that may push the WR need down a bit further into the later stages of Rd-3 or even into Rd-4. I’m not sure that a WR is going to be their 1-st pick in the draft & guys like Campbell will likely be gone when they select + the Seahawks are a run first team reducing the value of the WR position some. How many touches would a rookie WR actually get? Perhaps draft selections from their 1-st pick on – will end up being: EDGE, Safety, WR, CB, LB, OL, DL. The EDGE, Safety & WR positions being very inter-changeable depending on players they like being available when they pick & which picks they end up with after the trade downs? I believe those are the positions of MOST need and will be targets in the draft and I also think that they’ll likely sign a FA veteran DL or two off the post draft scrap heap and only draft DL in the later rounds or sign as UDFA’s. Same with the OL dudes, unless a great OG falls to them in the middle or later rounds. A few more weeks now and we’ll all know for sure what they do, I can’t wait. Rob, thank you for all you do. Would absolutely love if you did a write up or study on Darnell savage. Rob, I’ve read a number of big boards that have Josh Jacobs in the top ten in terms of talent. What’s your opinion and how far does he have to drop before he becomes a Jarran Reed type of value pick? I wouldn’t draft him for Seattle. For me he’s not in the top-50. Rob, is low 40 reason why you don’t have first 3 round grade on Kelvin Harmon? There’s more than one reason. Very average physical profile, separation issues, not consistent hands. Just thoroughly unremarkable in every way. Option A, If a first rounder falls into let’s say #29 then don’t trade back again. Get a 3rd and maybe a 5th for trading back ~8 spots. This could give us a legit 1st round prospect for a position of need. A good TE, hopefully a starting safety (although Carroll seems to be in love with Hill). Some EDGE help, a development CB with good traits and a legit FB. This is a more risky, more potential-based draft in my opinion. Get a QB to help with the Russ-situation. Get a DT with good testing, great motor, but really rough, and questionable technique. A quick dude who needs some polishing at WR. A solid TE. A good, developmental EDGE. A CB who might have good future but still learns the position. And a solid FB. Doug Baldwin is saying lookout for Terry McLaurin. The last time he made such a prediction, it was about Paul Richardson. Doug Baldwin’s agent is also Terry McLaurin’s agent. And Baldwin has been bigging up his agent on twitter. So I wouldn’t read too much into this. Rob any thoughts on Jerry Tillery DT from Notre Dame he seemed to test well and Schneider likes early picks from bigger programs. 1. Bit of a strange personality. The ugly incident at USC was just bizarre. Think a lot of work is required to get an angle on who he is. 2. Not sure how he fits in Seattle’s scheme. He’s not a full time DT and yet he won’t offer much as a DE. For me he’s best suited to a 3-4 as a five tech. There are things they might like about him. His short shuttle, size, athletic profile. But that’s not the only thing they’re going to consider. It feels like they have nice depth at O-line right now. Do you think they float a trade of Ifedi, with the idea of letting Fant and Jamarco Jones compete for the right tackle spot? Or seeing what they can get for Pocic or Britt. To gain draft capitol or salary flexibility? No. And doubt they’d get any kind of value even if they did. Keep the OL together. You said it yourself John – we have good depth right now. I am one of the few who believes in Ifedi and have done since day one. Isn’t Jones a LT and Browns replacement down the line? I think we should keep Pocic around. Not so sure he is a Solari kind of guy though, but let’s not give up on him yet. I think our O-line is looking good at the moment. I feel if they could get a 4th for Pocic, they’d trade him. Seems like Solari got control of the line. He got Fluker, he got Iupati. All his guys. I think Sweezy wasn’t resigned, because he’s not all that Solari-kind-of-guy. He likes big guys inside and I feel he’s right, and I’m not sure where Pocic fits. Thanks again Rob for all your hard work! Best Seahawks Blog on the web! Looks like we won’t be getting an athletic profile for Jachai Polite. Ran the forty and now being attended to. #Gators DE Jachai Polite getting his right quad/hamstring wrapped with ice. Looks like his day is done. How to destroy your draft stock in one off-season… by Jachai Polite. What a plonker. Whelp, there goes that if this is true. Wonder if that means a reunion with Kearse is more likely. Can’t wait to see where @_gman12 [Gary Jennings] gets drafted. Better prospect than some of the WRs being talked about on Day 2. Thanks, Rob! This is awesome… just hoping the competition isn’t listening in! I guess I need a refresher, 1st/2nd/3rd round grades. Here is what I always thought. The grades are criteria that are consistent from year to year. First is a starter right away; expected to be perenially among the best at his position. 2nd is a good high quality starter eventually, but maybe not a consistent starter in his rookie year. 3rd rounders are still expected to start eventually, but maybe an expected ceiling of good/median starter at the position. Rob, is this similar to your grades above? I imagine ceiling and floor also factor into the projections, but not sure how talent is weighed versus risk (injuries, character concerns, etc.). No. I’m just projecting the range I think every player deserves to go based on talent/potential. I didn’t see Armon Watts making a 3rd round grade. Seems like he matured and finally got it together for 2018, 7 sacks from the DT position. Could be under valued as a one year starter. From the highlight tapes, he looks like an up-field disruptor in the middle. Hmmm, good name to look into. Was injured in combine drills though, so he didn’t do any jumps or agility testing there nor at his pro day. So kind of hard to get a grasp of his athletic profile. Also, why did he only start one year at Arkansas? From what I have read he seems like a late bloomer who is not a big athlete but figured out how to use his power and hands. After more research, he seems to be climbing up draft boards. Whatever happened to Khalid Hill the FB prospect from last year? I remember a lot of people being excited about him but he didn’t make the 52 and then seemed to drop off the earth. Released with an injury settlement. I don’t know the extent of the injury.